Check out this latest story on CNN.com about a press briefing on what sounds like the First Strike Rations. 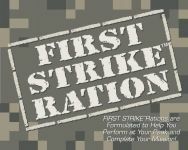 The article sounds like it's talking the First Strike Rations (with the mention of it being a new ration and how it has 3000 calories per ration) but then it also talks about new items like Garlic Mashed Potatoes and Beef and Black Bean, which I'm pretty sure are new 2008 (regular) MRE menu items. 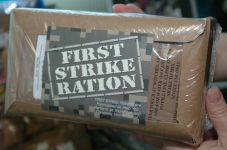 And it also mentioned how Flameless Ration Heaters are included...and those definitely aren't included in the First Strike Rations. But it's still good to see MREs and FSR getting some exposure in the press. WASHINGTON (AP) -- Don Egolf remembers what Army chow looked like when he served in Germany in World War II: A tin of scrambled eggs and bacon bits that he pried open with a tiny can opener. On Wednesday at the Pentagon the 102nd Infantry Division vet pocketed one of those irksome little openers, the P-38, as a souvenir. Then he dug into the latest in combat cuisine, a plate of blackened catfish, teriyaki chicken, little french toast squares and pumpkin cake -- no opener needed. 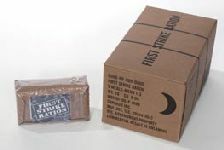 The Army offered up samples of the food as it rolled out its newest innovation -- special packets of easy-to-eat, high-nutrition, high-calorie foods designed for mobile forces. The chow, mostly bagged finger-type foods that soldiers can just tear open and eat on the run, will be available in the field next month. Click here for the full story and a CNN interactive timeline of rations in the US military.